In 2012, we provided a hybrid program. One day of our festival was unthemed with the rest of the festival being themed. The unthemed day allowed us to create a program across the disciplines of art and science, from recent advances in our understanding of quantum physics to an artists interpretation of bird flight data. The second day of our symposium focused on artists and scientists working in biology. As well as covering a spectrum of disciplines we like to explore topics at different scales. In exploring the theme of biology we moved from the cellular level through to larger systems. At the upper end of this scale one of these presentations explored ways in which biology can influence robot system design. There is a growing movement towards biohacking and DIY biology amongst artists. We learned about some of the techniques being used as well as discussed the ethics in carrying out this work. These questions are becoming more relevant at a time when artists now have the ability to explore the manipulation of life at the DNA level. The second day of our symposium with a theme of biology will act as a natural springboard into our final day entitled ‘The Immortal Body”, curated by Zulfikar Hirji, associate professor of anthropology at York University. “The Immortal Body” program was inspired by the story of Henrietta Lacks. She was a 30 year old African American woman who, in 1951, unwittingly had cells removed from a tumour. These cells would become an immortal cell line that is extremely robust and easily multiplies. These cells, known as HeLa cells are used till this day in scientific and medical research. As part of this year’s festival, we invited Alondra Nelson to deliver a keynote talk entitled, “Henrietta Lacks in Text and Context.” This presentation along with others during the day provided some insight into the radicalized and gendered biases that exist within medical and scientific communities. Choreographer Gail Lotenber and her dance company, LINK Dance, were also in attendance. Gail presented a full-length performance of Experiments at the Winchester Street Theater. This served as an excellent example of how ideas in science and art can merge to provide a deeper understanding of both disciplines. A collaboration between ecologists and dancers, EXPERIMENTS probed the connections between science and art to unveil the creativity, experimentation and intuition employed in both disciplines to understand, the world around us. For three years, LINK Dance Artistic Director Gail Lotenberg researched this piece with a group of dances and renowned ecologists, specializing in the study of animal behaviour. During the performance, a world of new ideas came alive. Like speed dating, but without the overt romantic overtones, this speed networking gave artists and scientists an opportunity to sit down and talk about their work, their interests and whatever else they could cram into 5 minutes of face time. When the bell rang, you moved to the next table until you had met as many people as you could in an hour. A relaxing time-out in the middle of the Festival. Hotel Ocho was our host for a casual get-together. In 1951, Henrietta Lacks, a 30-year-old African-American woman died of an aggressive type of cervical cancer. A tissue sample taken by her doctor at Baltimore’s John Hopkins Hospital without her knowledge or consent proved to be ‘immortal’ and survive outside her body as well as multiply. Her cells came to be known as HeLa cells. They were subsequently used in scientific research around the world enabling numerous breakthroughs in medicine including various cancer therapies and the polio vaccine. HeLa cells have since proliferated into a multimillion dollar industry, but many African Americans like Henrietta Lacks and her descendants have regularly been denied and deprived of medical treatment and used in scientific experiments because of their race and social status. The story of Lacks and HeLa cells raises questions about the complex history of biomedical science and the social, economic and political roles of science and technology in contemporary society. Moreover, these stories force us to confront the often euro-centric, racialized, gendered, and classist biases embedded in scientific practices and conceptions of the human body and life itself. The Immortal Body symposium explored these issues through a range of productive conversations between scientists and artists who explore and debate these issues through their lives, work and practices. The programme was curated by Zulfikar Hirji (Associate Professor, York University) and supported thanks to a Community Partnership Grant from the U.S. Mission in Canada. The relationship between art and science has always been multifarious and today, in the age of technoscience, has become decidedly ambiguous. Between the mechanisation of living things in biological science and the “bringing to life” of machines within the exploration of artificial life, the protagonists of transgenic art and artificial life art have dared to adopt the methods and procedures of life sciences, creating new art forms in the process. “BioArt—Art from the Laboratory” is a documentary about the BioArt movement, its technical aspects, new visions and a new approach to mankind’s great philosophical questions coupled with insights into the amazing work of progressive bio-artists. Bioartists and biological scientists in conversation with the creator of BioArt, Robert Stylo. The phenomenal success of the critically acclaimed book, “The Immortal Life of Henrietta Lacks,” inspired an international conversation on health inequality and bioethics. This talk retraced the story of Lacks’ life and death with an eye to how the milieu of the late 20th century United States rendered this poor, black woman’s HeLa cells “available” for extraction, circulation, and commodification. Lacks’ experience was, in some ways, as extraordinary as her “immortal” soma. Yet moving from the Tuskegee syphilis experiment, which began two decades prior to Lacks’ death, to the emergence of coercive sterilization politics and the Black Panther Party’s health activism two decades hence, we saw that her treatment was, in many other ways, typical of Jim Crow healthcare and of the gendered trajectory of medical discrimination in the U.S. Understanding the social and historical contexts that conditioned Lacks’ fateful end, we come to appreciate the enduring relevance of her life’s example for the rights and wellbeing of us all. Local artists responded to Alondra Nelson’s presentation. Physarum poiycephalum is a tiny yellow microorganism that displays primitive intelligence, problem solving skills and memory. This slime mould is used as a model organism in many areas of researchincluding city planning, adaptation and robotics. It also makes for a great creative collaborator: kept dark and damp, and fed on a diet of porridge oats, it will grow in beautiful patterns whilst foraging for food. Guests joined artist Heather Barnett to discover the fascinating role this single-celled organism has to play in the culture of both science and art, and participated in a practical experiment to create the ideal creative environment for it to grow. Each participant took home their own pet slime mould at the end of the session, and were invited to share the results of their experiments on The Slime Mould Collective @slimoco.ning.com. Organism, equipment and consumables were provided. This presentation discussed research into new kinds of knowledge representation crafted through the combination of data collected from sensors, with intuition collected from people in interviews, to a third system capable of insights neither machines nor people can produce in isolation. Marc described current field experiments and installations that integrate this approach with biosensing systems. The first one, based in Buffalo, helps people know if it is a good day to go for a swim. The second system, based in Indonesia, will help superstitious villagers share clean water wells and avoid contaminated ones. The presentation ended with a discussion of WaterBar, a public water fountain for the post-sustainability age; when clean water is simply not good enough. The physicist Richard Feynman once said that the double-slit experiment contains within it the very ‘heart of quantum mechanics”. Despite being nearly two-hundred years old, the double-slit experiment is still capable of showing us new insights into the quantum world. In this talk, Krister covered some of the work being done at the Institute for Quantum Computing, using a technique known as weak measurements, to get a better picture of what goes on inside the double-slit. This talk contrasted the positive and negative ways that biomimetics can be applied to creating new things. James explained the importance of combining knowledge in both the biological sciences and in engineering in the development of future technology. Legged robots, wind turbines, aircraft and bullet trains were among the examples highlighted. 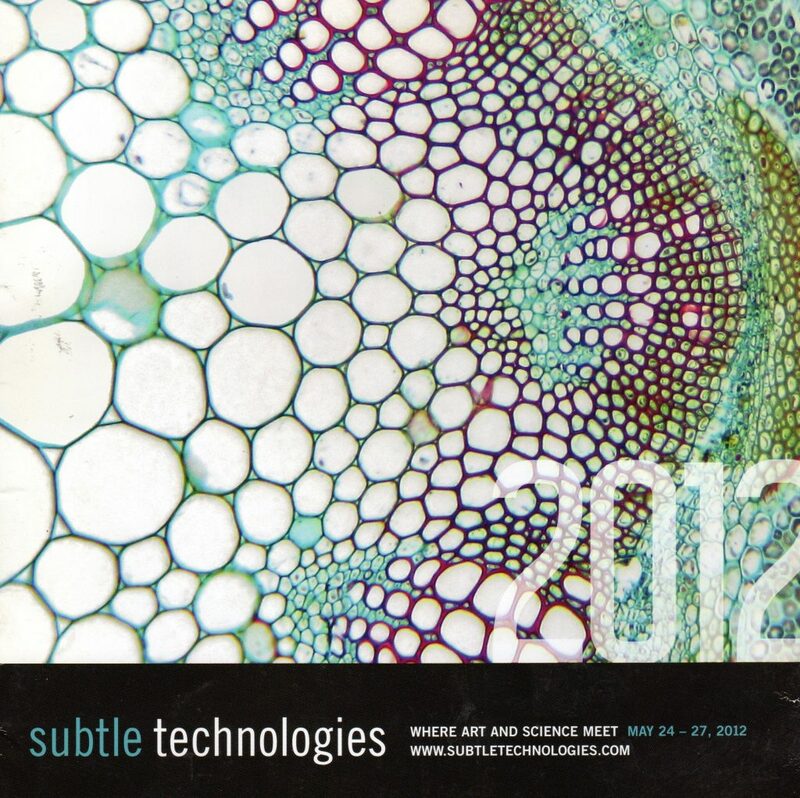 Art from Synthetic Biology involves a daily laboratory practice using synthetic biology. The presentation was aimed at looking at the issues surrounding the production, ethics and exhibition living artworks that involve genetically engineered organisms. The Sensorial Invisibility of Plants focusds on complexities in recognising plant behaviour. It explored the contradistinction between scientific studies that reveal cognitive capacities in plants and our subjective perceptions where plants appear motionless and devoid of sensation. My anatomical pathology is reduced by MR! to readable 2D scans or maps. By drawing, I map my pain and limited movement through imagery. Where and how can these maps—MRi, a digital technology, and drawing, a technoiogy-of-the-hand, overlap to produce visual art at the service of healing? Each starts this problematic from the perspective of his individual unique practice, radioiogy and visual art. Neither knows, from the outset, how to solve the problem. Cellular Performance was an interdisciplinary project that Verena developed in collaboration with several partner institutions. Working in a bioscientific laboratory, Verena engineered human skin cells to grow into two-dimensional patterns. The work resulted in a video installation showing microscopic time-lapse recordings of the manipulated cells that are forming up to readable text and disperse again over time—visualizing terms pulled from the advertising language of care products industry. The project was accompanied by a theoretical elaboration discussing the beauty industry, marketing strategies, the dream of immortality, aging, the life sciences, bioengineering and related societal and ethical issues. Disturbances in flowing blood are clinically important, but not well understood. This is not helped by the fact that visualizations of blood flow, whether from medical imaging or computer simulations, can obscure as much as they enlighten. The goal, unique to the study of blood flow, was to use sonification of the velocity data, and in particular the principles of dissonance and harmony, to discriminate deleterious from beneficial blood flow patterns, alone or in concert with traditional visualizations. The artistic and scientific creators of EXPERIMENTS discussed their unusual collaboration in a lively interactive session. Primate Cinema: Apes as Family was a two channel video installation: an original drama made expressly for chimps on one side, and the chimpanzee audience, on the other. The drama followed an urban female chimp—an actor in animatronic costume—who met some wild foreigners. Chimps responded by touching the screen, ignored it, or just sat and watched. The two channels created a prism for humans to tear about their primate cousins, who are, like us, fascinated by cinema. Is the ancient dream of reviving past lives made possible by recent cloning technologies? Marguerite’s pre-posthistoric epic quest investigated the reality behind the contemporary rumours. She went on an obsessional quest to resuscitate the sound of extinct animals by reconstructing their vocal tracts. As the vocal tract is made of soft tissue, it does not fossilise. The data is lost and has to be redesigned. The scientific evidence runs parallel to the rumours, fears and fictions. Advice from experts as well as predictions and invented facts were used to craft the new creatures. Stucke’s project on Symbiosis State intersected between ideas within evolutionary biology, consciousness studies, philosophy, and the imagination. Primarily working within the mediums of painting and drawing, she considers her work artistic research, which involves interdisciplinary investigations within artistic production. Stucke challenged the dialogue between art and science by placing imagination within ideas of research. In this talk, Andrew discussed the recent bio-hacking activities and the Pelting Lab for Biophysical Manipulation. The lab is focused on the manipulation of life with artificial stimuli and microenvironments. Andrew also discussed manipulations of various magnitudes, including the culture of cells onto bio-incompatible substrates with no relationship to any natural micro-environment, the growing of human-jellyfish hybrid ‘skins’ onto LEGO mini-figures, and ‘organ-hacking’ (the re-purposing/re-culturing of tissues and organs for nonbiological means). The lab is a curiosity driven environment interested in finding the limits of normal biological function and pushing beyond them to create something new.